City College’s creative writers certificate, a collaborative effort of City College’s English department, is available to students for the first time in the fall 2016 semester. The creative writers certificate is a well-rounded interdisciplinary program that prepares students to pursue a creative writing degree in the publishing industry. In order to complete the creative writers certificate, students are required to study a variety of of subjects and can choose from a spectrum of diverse courses. Course offerings range from subjects traditionally offered in creative writing programs such as Intro to Fiction to more expressive classes such as Beginning Storytelling & Performance. “Often the classes go deeper than the subject matter; many students are able to express important ideas about themselves and the world [and] create the world they want to live in,” said Cynthia Slates, a creative writing program coordinator. “Everyone should take at least one class in creative writing or craft exploration before they leave City College,” Slates said. 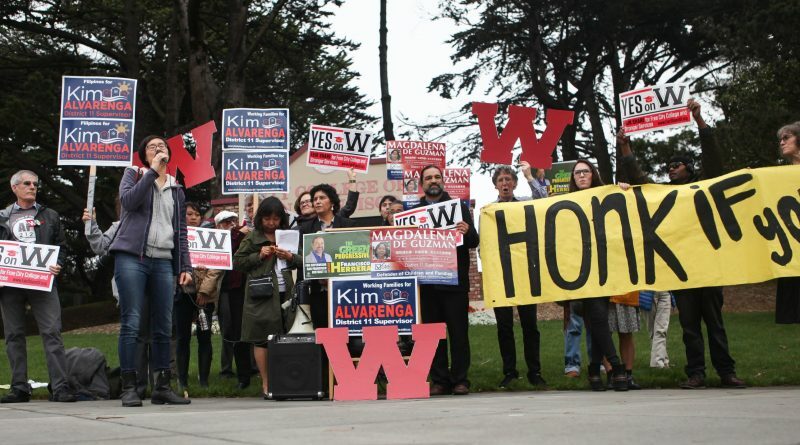 San Francisco voters will help determine the possible future of City College when they go the polls on Nov. 8. The college faces the prospects of additional revenue from Props. B and W that will further stabilize the college’s fiscal picture and insure increased enrollment. Prop. B raises the local parcel tax from $79 to $99 to help fund City College for 15 years. But both measures are not without their share of controversy that centers around the actual use of the funds and who would be burdened. As election nears, City College chanted their support for a tuition-free community college at the corner of Ocean and Phelan Ave. 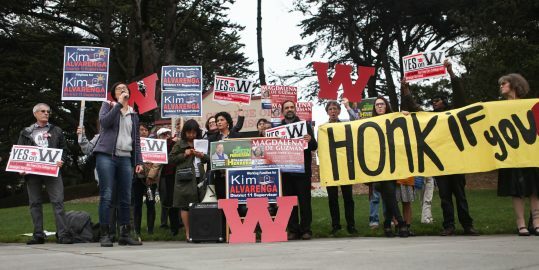 Faculty members, students, administration and District 11 candidates from the San Francisco’s Board of Supervisors gathered to voice the benefits of attending a free college. Candidates Kim Alarenga and Magdalena De Guzman highlighted how Free City will benefit the college. The chanting has been going on for months since the proposal of Free City from Board of Supervisor, Jane Kim. Signs were held high, such as a big W accompanied by fists waving in their air. Social media giant Twitter will begin laying off approximately 300 employees starting the week of Oct. 25, 2016 to redefine its business model. The Christian Science Monitor reported that Twitter struggled with advertising and user growth over the past few years compared to apps like Snapchat and Instagram. The cuts echo a downsizing effort initiated by co-founder Jack Dorsey that laid off 336 employees on Oct. 13, 2015. Downsizing is seen as favorable while Twitter tries to find a new purchaser, as Fortune Magazine has noted. Promising deals with Salesforce.com Inc. and Disney fell through last September because both of them expressed concern about preserving their individual images. Although Twitter is a platform for professional connections and topics, it also has a sizeable population of “trolls,” or individuals who post inflammatory content on purpose for attention. Twitter has already discontinued Vine, a video app it purchased four years ago, on Oct. 27, 2016. It remains unclear if Twitter’s acquisition of the live video broadcasting service Periscope will be impacted. The hacking of one of the the nation’s largest domain system providers temporarily stalled approximately a dozen major websites on Oct. 21. Sites put to a halt were Twitter, Paypal, Netflix, Spotify, Reddit, Amazon, The New York Times, The Boston Globe and more. The New York Times reported that three service “attack waves” occurred from 7 a.m. to 5 p.m.
“The number and types of attacks, the duration of attacks and the complexity of these attacks are all on the rise,” Kyle York DYN’s chief strategy officer told The New York Times. What is to be considered a common attack is named a distributed denial-of-service attacks. Dyn DNS, a Internet performance management company is currently investigating the attacks.